ABIDJAN, Feb 25 2014 (IPS) - Armand Konan stood in front of the Palais des Sports, a stadium in Abidjan’s popular neighbourhood, Treichville, selling videos and speeches of former Ivorian President Laurent Gbagbo. “People need to remember what our president said…He is our president. And we want him back,” Konan told IPS. While Gbagbo waits for his trial at the International Criminal Court (ICC), his party, the Ivorian Popular Front (known by its French acronym FPI), is slowly recovering its political might in this West African nation. Gbagbo is accused of crimes against humanity for his alleged role in the 2010 to 2011 post-electoral crisis. More than 3,000 people died in the violence that followed Gbagbo’s refusal to concede victory to current President Allassane Ouattara. 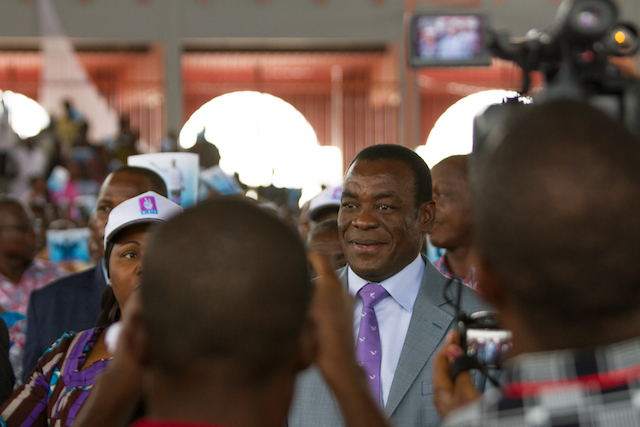 But as the country’s 2015 elections approach, the future of the FPI, one of the most important political forces in Côte d’Ivoire, hangs in the balance. While the next presidential polls will be held in October 2015, the FPI has not decided if it will run or continue its boycotting of elections – which it began doing during the 2012 legislative elections. And, so far, they have no official presidential candidate. Inside the walls of the Palais des Sports, in the Ivorian economic capital of Abidjan, there were about 2,500 people who agreed with Konan. 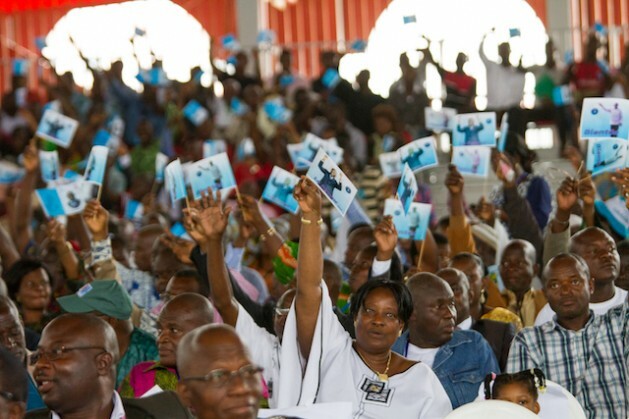 While it was not the first FPI rally held since the post-electoral crisis, this Feb. 21 to 23 convention was the first major political meeting to be held in Abidjan that was approved by authorities. The ex-president might still be held at the Dutch prison complex in Scheveningen, but Gbagbo’s influence over his party remains strong. “This convention is a tribute to [him]. We are determined to struggle for his liberation,” said Pascal Affi N’Guessan, the new president of the FPI, to much applause. Henriette Broh is a hardliner who refuses any alternative to Koudou, as many here fondly call Gbagbo. She is certain that by the time the 2015 elections come around, Gbagbo will be free and she will be able to vote for him again. “Laurent Gbagbo will be liberated soon. This is what god wants. We know it. The ICC has no proof. And he will come back to clean the mess that was [made by] Ouattara. They are robbers! They stole the elections. And now they steal the money,” the 50-year-old told IPS. Like many Ivorians, she accuses the government of “kidnapping” the economy and favouring its own group of supporters at every level of the administration. Locals have even created a word for this: “Bakayoko-isation” — it is a grouping of the last names of several figures around Ouattara including, the current Minister of Interior Hamed Bakayoko, and others who have the same surname but are not from the same family. “The almost 10 percent growth rate? No Ivorian has seen [the benefits of] this. The cost of living is higher than ever. The government is lying,” said Anselme, another militant FPI supporter, who refused to give his last name as he feared reprisals. Since last August, President Ouattara has made several attempts to open dialogue with the FPI. The opposition leaders have met the government on several occasions and there have been constant rumours – which were never acknowledged – that a national coalition government will be formed. But it will take more than talks for FPI supporters to forget the hardships they experienced over the last few years. Affi N’Guessan was arrested when Gbagbo’s regime collapsed in April 2011. He was liberated on Aug. 6, 2013. A hundred other FPI leaders, who were present at the convention, were also imprisoned and then released on bail or went to exile. Several FPI supporters are still imprisoned, while others have had their assets frozen and claim to have been illegally evicted from their homes. On Sunday, Feb. 23, the FPI closed the convention with a popular rally in an historic place for the FPI, the Ficgayo Square in Yopougon — a neighbourhood that has been very supportive of Gbagbo. Affi N’Guessan asked for “real justice”. “For an effective, sincere and frank reconciliation, we have to move away from the victor’s justice. We have to free the ones still in prison, because they are there in the name of this victor’s justice,” Affi N’Guessan said. Doudou Diene, United Nations independent expert on human rights, who visited Côte d’Ivoire last week, seemed to agree and called for the prosecution of perpetrators. “There is considerable progress made, but more needs to be done in terms of political dialogue,” Diene said. At a bus stop in central Abidjan, Awa Konate, a 25-year-old law student, agreed with Diene’s analysis that no matter the outcome, the FPI needs to get involved in the political process to avoid another violent crises. “I did not vote for the FPI. But almost half of Ivorians voted for them. You have to respect that. We are tired of crises.